Special support page for Subaru cars. Updated December 2015. This support page covers the SSM support over K line and CAN bus for Subaru cars using OBDKey. Feedback is welcomed via OBDKey Support. OBDKey was updated with Subaru SSM protocol support in 2010 using the 4800 baud rate serial data communications on the K-Line (OBD J1962 pin 7) interface. Many early Subarus are not OBD-II compliant as they have been built before the US requirements date of 1996, or the European requirements date of 2001 or because they were launched in markets that did not require OBD-II compliance, like Australia, Japan and the rest of Asia. In these cars there is still an OBD-II style socket but OBD-II is not supported. However, there is a protocol unique to Subarus called SSM which OBDKey can use in these cars. Additionally, in OBD-II compliant Subarus OBDKey can take advantage of the car's support for both OBD-II for diagnostics and SSM for data acquisition. Later, Subaru cars switched to using the CAN bus based protocol for OBD-II diagnostics. This came in about 2008 (to be verified) and has much faster data access. In the later cars the original SSM protocol over K line was dropped and SSM over CAN bus was introduced. In May 2014 the OBDKey Fault Code Reader for Android and Windows was enhanced with reading and clearing fault codes from the engine ECU using the Subaru SSM protocol. 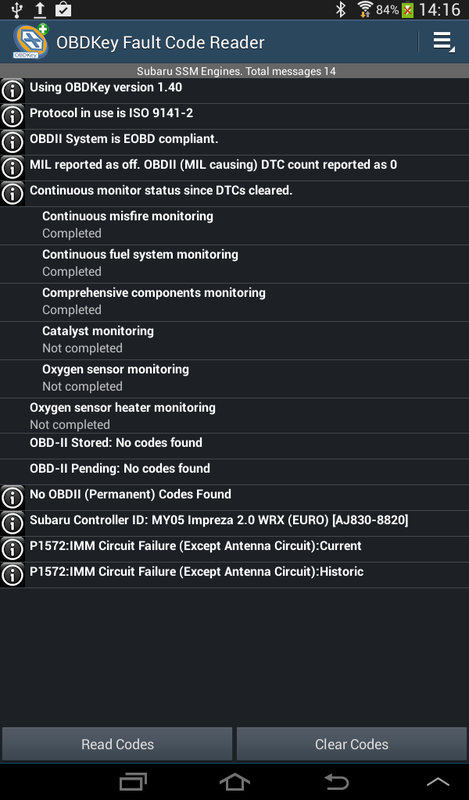 OBDKey Fault Code Reader for Android Showing Reading of Engine Fault Codes from the Subaru engine using the SSM (over K Line) protocol. Windows software application for configuring the OBDKey unit as either a standard OBD-II interface or for the Subaru (SSM) mode interface. Run the application and open the serial (COM) port for OBDKey. Then choose the "Switch to OBD-II" option for normal OBD-II operations. You will need to run this and switch the OBDKey unit to SSM mode before running an SSM application like EcuExplorer, then run it again and switch the OBDKey unit to OBD-II mode before using standard OBD-II software. OBDKey Fault Code Reader For Windows - Version 1.48 with Subaru SSM (over K line) support added. OBDKey Android Torque Tutorial for Torque before Dec 5 2015. If you are using Torque Pro (OBD 2 & Car) please install the latest update since 5 December 2015 / Version 1.8.80 which supports OBDKey without needing to first configure the OBDKey unit specifically.